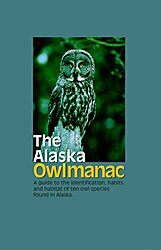 This information is from The Alaska Owlmanac: A guide to the identification, habits, and habitat of ten owl species found in Alaska. Owls could be considered the “Terminators” of the bird world, as they are finely-tuned hunting machines. Large eyes enable them to see in the dark. Their acute hearing can pinpoint the precise location of small mammals — even under a blanket of snow. They glide on silent wings to grasp unsuspecting prey with their piercing, curved talons. Owls are aerial predators and they need all of these adaptations in order to survive. These mostly nocturnal (active at night) creatures are the subject of numerous myths and legends which credit them with attributes as noble as wisdom, and as gruesome as a foreshadower of death. Whatever image they hold for you, there is no doubt that owls are incredible birds. There are ten species of owls in Alaska, inhabiting landscapes as diverse as the windblown, treeless tundra of the Arctic, the deep, still, boreal forest of the Interior, and the moss-draped rainforest of Southeast. To hear their haunting calls emanating from the darkened woods is a thrill, and to catch a glimpse of their silent flight is a privilege. The more you know about the behavior and habitat of these elusive birds, the better you will become at seeing and hearing them. We hope our Owlmanac helps open your eyes and ears to Alaska’s Owls. Please be respectful when viewing owls and admire them from a distance. Like other birds of prey, they are protected by federal law. It is illegal to kill owls, possess live or dead owls or owl parts, and it is against the law to disturb their nest sites. Alaska hunting regulations do allow state residents to harvest Snowy Owls in certain areas of the state provided that the birds are used for food or clothing, and no bird or part of a bird may be sold or offered for sale. For more specific information see state and federal regulations.